Koster is a woman’s knitted cardigan with instructions for both a solid version and an intarsia version using Valley Yarns Taconic Cashmere blend. The intarsia pattern is in chart form only. Koster is a woman’s knitted cardigan with instructions for both a solid version and an intarsia version using Valley Yarns Taconic cashmere blend. Cornwall is a neck warmer knit in Valley Yarns Northfield with an oversized Flying Geese pattern. This cowl is knit flat, then at the end the live stitches are grafted to the cast on edge or bound off and sewn. 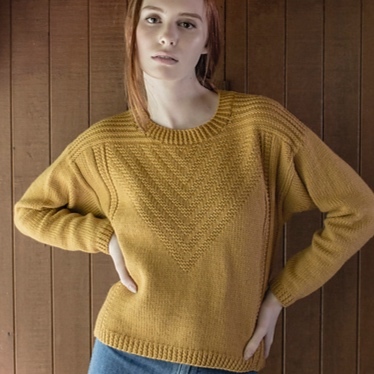 The cropped version of this modern Guernsey inspired pullover is knit in Valley Yarns Amherst.The chevron pattern is in chart form only. The longer version of this modern Guernsey inspired pullover is knit in Valley Yarns Wachusett, cashmere blend. The chevron pattern is in chart form only. Mollina is a hat and mitt set knit in Valley Superwash DK Hand Dyed by Manos del Uruguay. The triangle pattern is both charted and written out.